Back in time for Spring and Mother's Day! 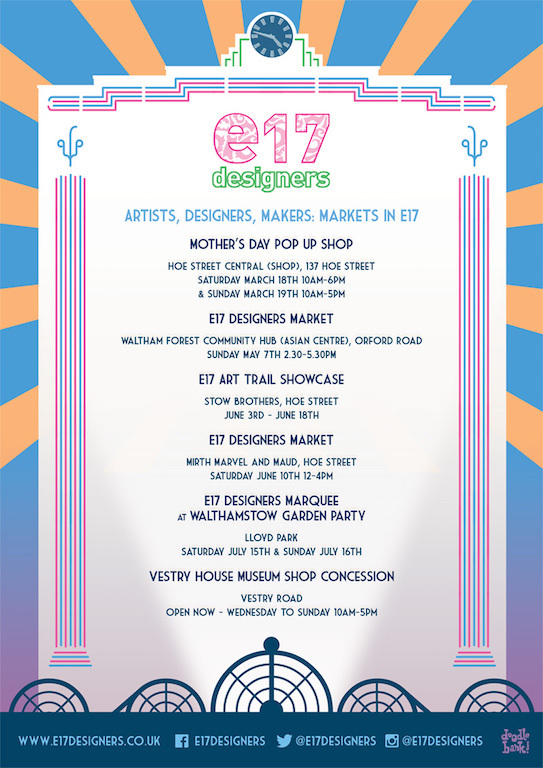 E17 Designers’ will be offering a unique opportunity to browse and buy mostly handmade goodies from emerging and established makers and designers, just in time for a bit of ‘mothering’. Forget Selfridges, whether it’s mum, sister, aunty or nan, a carer or anyone else who deserves a special thank-you, E17 Designers’ has something for them all under one roof for this weekend only: funky bags, cute purses and more from Craftee Fox, Mika BonBon; Lauren Grace’ jolly ‘custard cream’ charm jewellery, to prints, handmade cards from Vintage Playing Cards and Fran Wood Design, fashion for mums and babies from D4Discus, Lila-Rose and KOCOKids, who will bring a much needed spring pop of colour to the shop! Other accessories for the home such as mini concrete planters from Edie Rose and Miss Lovell’s incredible (almost edible) candles and soaps – some gifts at prices that even younger customers can afford! For sweet success, our Suzie Cakes will have some special take away treats as well! Don’t forget to make a full weekend by brunching/lunching at Today Bread, next door in Central Parade, and visit the new incubator studios. Copyright © 2017 E17 Designers, All rights reserved.